Last week I had to tell my pup to “Drop it!” on the trail. Why was Dog Mom raising her voice this time? Because man’s best friend had part of a deer leg, hoove still attached, in her mouth. Being that I am the best Dog Mom ever (In her pea-brained mind) she was thrilled to bring me this magnificent gift. Obviously, I was less than thrilled. This is exactly the kind of thing you can expect to happen to you if you go on a twenty plus mile trek through the San Gorgonio Wilderness with man’s best friend at your side. My dog was built for endurance hiking. She’s not a little dog who travels in a purse and goes shopping with you at the mall. She’s a mutt; part terrier, beagle and pug. She’s got the terrier energy and she can go, go, go all day long. (Sometimes it can be exhausting for the people and kitty cats around her in our home) Taking her for a hike up an almost 12,000-foot mountain is a great way to exhaust her. (And Dog Mom gets some peace and quiet at last) It’s normal on our treks through the local wilderness to run into a pack of coyotes or for me to spend my time discouraging her from trying to play with the wild donkeys. 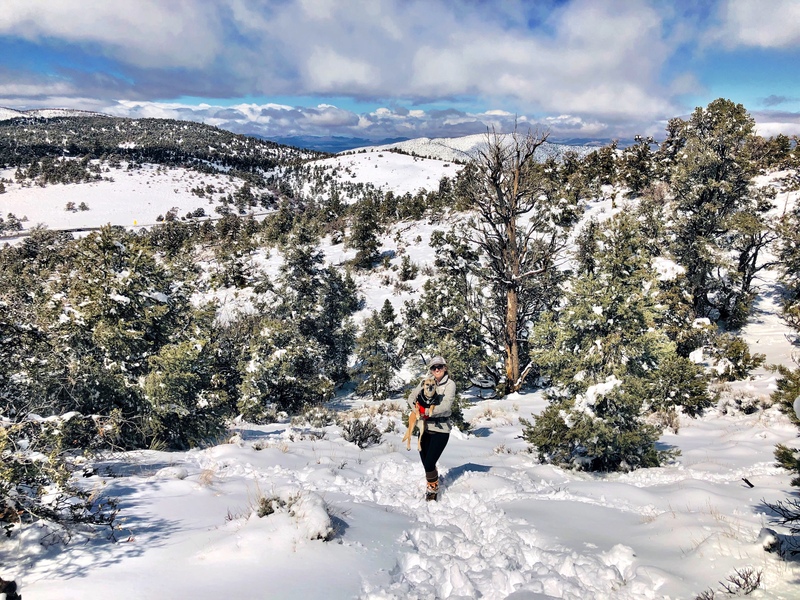 One of our favorite areas to hike in the winter months is the San Gorgonio Wilderness but this backcountry is not for every hiker or every dog. You need to have the correct supplies for yourself and your pup when going out for a hike up Vivian Creek or South Fork Trails. I also highly recommend not taking your dog on a strenuous hike like this if you and your pup are not in shape for this kind of wilderness trekking. The two best ways in my opinion to summit San Gorgonio would be Vivian Creek or South Fork Trail. Vivian Creek is the shortest way to the summit of San Gorgonio and the easiest for you and your pup, at 17.2 miles. With that kind of distance to cover in one day, this trail is no walk in the park but it’s worth it for the kind of views you get from the summit. It literally feels like you are standing on the top of the world. 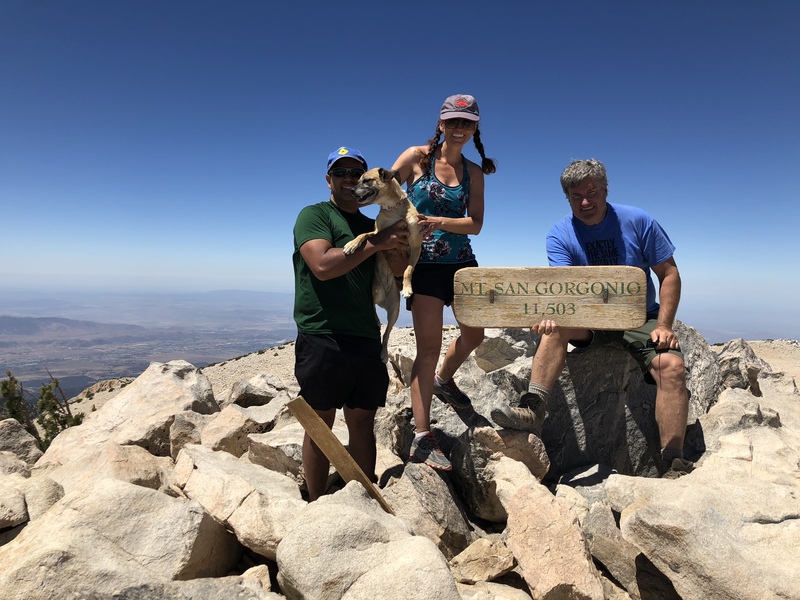 San Gorgonio is the tallest mountain in southern California at 11,503 feet and it’s an impressive feat to summit in one day. 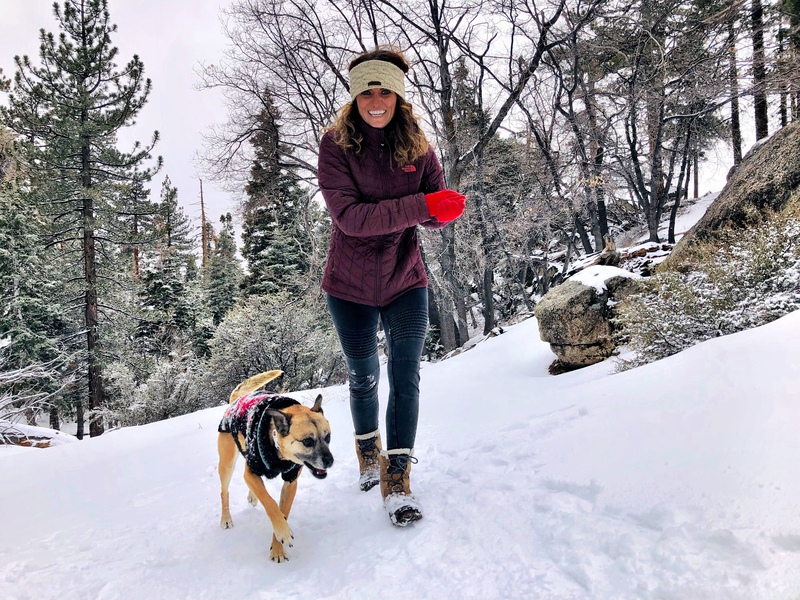 Packing for a day on the trail with your favorite pup is easier then saying “Get the ball” if you plan to ascent up the highest peak in Southern California anytime this year. What does your favorite pooch need to summit? Let’s start with the basics; a leash of course and if it’s snowy a doggy sweater will help break the wind chill at the summit. If you are hiking in the spring or summer, I recommend a bear bell to warn other wild animals your pup is on the trail. I don’t worry about packing water for my pup going up to San Gorgonio as there are many seasonal creeks along the way. My pup may be able to hike up a 10,000-foot mountain but there is no way she will eat kibble on the trail if I bring some in a baggy. Obviously, she would rather have a bite of my gourmet tuna sandwich. Tuna with bacon and aged Australian cheddar or dog chow; what would you choose? I pack beef jerky, sweet potatoes and peanut butter granola bars, and then Dog Mom just prays Carly will decide she feels like eating while out on the trail. There’s nothing like summiting this great mountain with your favorite mutt by your side. Being prepared for a long hard hike with your pup is so important. Let her take lots of breaks on the ascent up and if she gets too tired to summit, try another day. It’s not worth your furry friend getting hurt! You have such an active and adventurous life, and I enjoy reading about it. I noticed that you post early to the grid each week. This is great, but I also noticed that there are several proofing errors, that break up the flow of your writing and pull the reader away from descriptions, that slip through. Giving yourself an extra day or so to post, and seeking out a beta reader could help you overcome some of those issues. If you’re not sure where to find a reader or don’t have someone you trust to pick up those glitches in grammar, punctuation, or flow, you can always ask in the YeahWrite Coffeehouse (https://www.facebook.com/groups/yeahwritecoffeehouse/) on Facebook. There’s usually someone there who’s happy to read, or to trade work. wow that’s great that you are able to go on so many fun adventures with your dog! Sounds like a great hike! Love the description and photos. Makes me want to take up hiking. While walking my dog yesterday, I had to knock a half-eaten hamburger out of her mouth. She does not understand “drop it”… sigh. Ha! My woofer also refuses to eat anything but human food on hikes. The looks he gives me are scathing when I offer him kibble (he has to carry it, I don’t see why he won’t eat it). He usually ends up eating part of my cliff bar. Charlie is 14, but I’m hoping for at least one last summer of hiking mountains with him. Great post! I’m almost jealous of CA. Sounds like a great hike! And I sympathize with your pup’s deer leg; that used to happen to us, too, when we lived in Idaho. I think the photos add a lot of impact to your essay. The personality shows through in your writing. I think a few punctuation errors slipped through, so another round of proofreading might have been beneficial. Thanks for sharing this! What I liked best about this piece is that you do not take yourself too seriously. It is chatty yet informative, and laid-back in a California kind of way. Thanks. Photos are a plus. I love that you can hike with your dog! Seems like the perfect way to get up mountains!